Renee Kolender's (nee Fuchs/Fox) mother's family, the Borenstains. First row, left to right: Rose Borenstain-Fuchs (Renee's mother), Renee, Renee's grandmother Borenstain, Yitzchak Fuchs (Renee's brother), Renee's grandfather Borenstain. The rest on this row are cousins and Rose's sisters whose names have been forgotten. 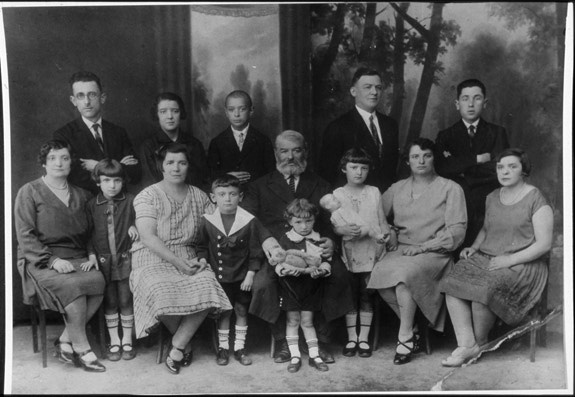 Second row, left to right: Moishe Chiel Fuchs (Renee's father), Tola Borenstain (Renee's aunt, mother's sister, who survived the war, lived in France, and died in 1996 or 1997). The rest on this row are cousins and uncles whose names have been forgotten. This photograph was taken in Koszenica, Poland, ca. late 1920's. The only survivors in the photograph were Aunt Tola, Renee, and her youngest uncle, who is in the second row.